We’d love your help. Let us know what’s wrong with this preview of Dream of Her Heart by Shanna Hatfield. * Garden of Her Heart (Book 1) - Torn between doing what her country orders and what her heart demands, Miko Nishimura discovers love can bloom in the most unlikely places and circumstances. * Home of Her Heart (Book 2) -He needed someone to remember him when he was gone. Instead, he found a woman he’d never forget. 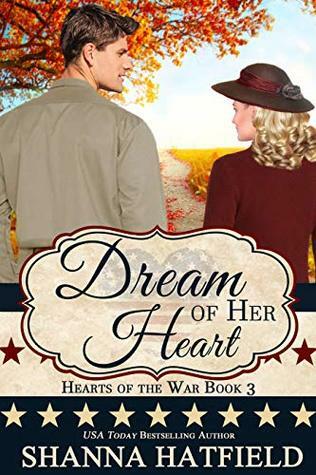 * Dream of Her Heart (Book 3) - Would beautiful Nurse Brighton be the woman to tame him, or merely a distraction to his wartime mission? To ask other readers questions about Dream of Her Heart, please sign up. I wasn’t prepared for the emotions this book was about to bring me. Shanna Hatfield is stellar in her ability to write books that develop her characters straight into your heart and very soul. Shanna truly incorporated a beautiful love story with Zane and Billie. A love story so heartwarming and poignant, you’ll believe its non-fiction. Dream Of Her Heart not only swept me into the story, it brought back memories of my Papa Douglas who was a prisoner in Japanese Prison camp for 3 1/2 years. His s I wasn’t prepared for the emotions this book was about to bring me. Shanna Hatfield is stellar in her ability to write books that develop her characters straight into your heart and very soul. Dream Of Her Heart not only swept me into the story, it brought back memories of my Papa Douglas who was a prisoner in Japanese Prison camp for 3 1/2 years. His stories he shared with me, which was special because he rarely talked about those days, still are vivid in my memory. Ms. Shanna I applaud you in writing such a defining book that was so detailed and prolific. It really pulled all my heartstrings. of Midway & Pearl Harbor. Nurse Billie. She is like a ray of sunshine. Zane & Billie become very close. I loved this book! The characters jumped off the page and the settings were vividly described. I felt like I was inside the story watching everything happen around me. I loved Billie and Zane!! Billie's ability to lift the spirits of everyone around her was inspiring. I loved the loyalty and love she was given in return. Zane is determined and dedicated. He is a fighter. I loved seeing the brotherhood among the soldiers and the strength that brought them. Zane is also quite the romantic. There a I loved this book! The characters jumped off the page and the settings were vividly described. I felt like I was inside the story watching everything happen around me. I loved Billie and Zane!! Billie's ability to lift the spirits of everyone around her was inspiring. I loved the loyalty and love she was given in return. Zane is determined and dedicated. He is a fighter. I loved seeing the brotherhood among the soldiers and the strength that brought them. Zane is also quite the romantic. There are so many swoony moments thanks to him! *sigh* He and Billie are perfect together. I loved watching their relationship deepen and grow. Their story touched my heart in so many ways. It will stay with me for quite awhile! This was a wonderful story with more twists and turns then I expected. I loved it. Author Shanna Hatfield brings to life another side of World War II, the nurses at home and the hospitals that cared for the wounded. You can see, feel the emotion of the wounded, nurses, and doctors during this whole book. I very much enjoyed the growing relationship between Zane and Billie. It wasn't rushed. Both Zane and Billie had things from their past that had to be worked through, and the journey was not eas This was a wonderful story with more twists and turns then I expected. I loved it. Author Shanna Hatfield brings to life another side of World War II, the nurses at home and the hospitals that cared for the wounded. You can see, feel the emotion of the wounded, nurses, and doctors during this whole book. I very much enjoyed the growing relationship between Zane and Billie. It wasn't rushed. Both Zane and Billie had things from their past that had to be worked through, and the journey was not easy. I also enjoyed what the Shanna Hatfield included in this book concerning her research. She incorporated so much into this book, and gave the reader much needed information on why it was important during that time. I literally walked in to this book with a bang, right along with Zane. Zane and Billie are those characters that steal your heart from the beginning. I really enjoyed the historical facts that were included, it gave the book that much more of a believable edge. I felt like I was transported back to WWII, and I was helping the war efforts while falling in love. Amazing way to feel part of a book. Thank you Shanna Hatfield! Book gifted to me. Wow this book had my attention to the very end with it warm loving story, mixed with a bit of history, you won’t want to put this one down. In a time of war, decisions and action are different from the norm with many lives changed. As this is set in the1940’s the author had captured the assents of the time period exactly as I believed it would have been. The 1940’s come alive in the words and as each page went by the more I felt for these wonderful characters in this wonderful wartime romance. I Wow this book had my attention to the very end with it warm loving story, mixed with a bit of history, you won’t want to put this one down. In a time of war, decisions and action are different from the norm with many lives changed. As this is set in the1940’s the author had captured the assents of the time period exactly as I believed it would have been. The 1940’s come alive in the words and as each page went by the more I felt for these wonderful characters in this wonderful wartime romance. If you have read the other books in this series you just might remember some of the characters that pop back up in this one again to entertain us again. I received an ARC copy of this book and this is my honest review that I write voluntarily and would highly recommend. Nurse Billie Brighton goes above and beyond to help her patients in the veteran’s hospital, where she helps returning wounded soldiers recover from the war. She loves to help the soldiers but she promised herself many years ago a soldier’s wife she would never be, she could not cope with the worry and the waiting. Lieutenant Zane West comes to Oregon to visit with a very good friend before he returns to the Pacific to continue the dangerous mission of flying his plane. He is most surprised when he arrives to learn that his friend Rock was not doing well and had disappeared from the hospital without a trace. He meets Nurse Billie Brighton who just happened to be Rocks nurse; she is puzzled and censured as to his whereabouts and offers to help Zane look for this friend. Lieutenant is a military man of ten years and has no plans to ever return to his family’s farm back in Texas. As the two searches for the missing soldier they both start to find that they have feelings for each other but on the eve of Zane’s departure, they decided to just stay friends. Dejected that he could not find his friend Zane ventures back to the war with the distraction of a very beautiful your nurse on his mind. The two keep in touch through letters and gifts and Billie will fight her own battle with her decision to not get close to a soldier. Will, she ever find her dream of a farmhouse with a dog and a few kids with a loving husband or will she just get her heart broken in the search? Zane always said he was married to the military and she was his wife and his good friends his family but will the feisty, caring nurse change his plans or with fate do that for him? If I wasn’t already a fan of Zane, the gift of the beautiful seashell he picked up on the beach simply because it made him think of Billie would have put me over the top. He showed the kind of loyalty and friendship that had him searching for his friend when he went missing from the hospital. He was playful, strong, determined and handsome as well. One fun quirk of his was that he liked reading the encyclopedia. Zane had developed a strong prejudice against the Japanese because of his experiences on the front and learned an important lesson related to that. Billie was a doll! She was the kind of girl who always thinks about others first and doesn’t even realize she is unusual for doing this. Everyone around her loves her, yet she feels isolated and alone. I loved the way she helped Jimmy, the young soldier who had lost his legs and his will to live. By a simple act of kindness, she brought him hope and life. And then the way she told off the sergeant. . . The combination of Zane and Billie was sudden and electric. The dancing in the rain and the final goodbye before he shipped off to Hawaii were heart-melting. I loved his big gestures. Oh, my favorite character was probably Petey! That adorable five-year-old made an already good story more enjoyable with his adorable expressions and his zeal! Oh, what a wonderful story, another from Ms. Hatfield that just touches your heart in so many ways. She creates fantastic characters, scenes and scenarios that just make you keep reading and such awesome heroes and heroines that her books are winning awards. This is the third book in this series about war and the lives of people affected and involved as soldiers. This one is about a nurse at the VA hospital in Portland who has a room full of injured men some barely men. She calls them her boys. A Oh, what a wonderful story, another from Ms. Hatfield that just touches your heart in so many ways. She creates fantastic characters, scenes and scenarios that just make you keep reading and such awesome heroes and heroines that her books are winning awards. A soldier walked in to find his friend who was badly injured when his plane crashed. He is told he left the hospital but not in good condition. This soldier has to try to go find him and the nurse offered to help with his search. Together they go on a few adventures to find his friend all the while falling in love but both resisting. This story takes us back to the characters of the first book and second one and linking some details together to make such a great read. This is one you one you can’t put down. It is long but believe me you don’t want to put this down not even to sleep. This new hero and heroine we met in Garden of Her Heart fight each other all the way because neither want involvement as he knows a soldier shouldn’t marry since they may leave a family behind and she because she can’t lose her heart to someone who may not come back. I highly recommend this third book as well as the first two, Garden of Her Heart, Home of Her Heart. This series is highly researched and so very good and full of historical information on certain battles of the WWII. This story takes place during World War II. It was definitely an eye opening book that held many historical details about the planes that soldiers flew and the attacks that took place. Billie is a nurse who takes care of wounded soldiers in a civilian hospital during WWII. The soldiers all love and respect her for the amazing care she constantly delivers. One day she meets Zane, a friend of one of her patients and the short time that they spend together leaves both of them wanting to see more of This story takes place during World War II. It was definitely an eye opening book that held many historical details about the planes that soldiers flew and the attacks that took place. Billie is a nurse who takes care of wounded soldiers in a civilian hospital during WWII. The soldiers all love and respect her for the amazing care she constantly delivers. One day she meets Zane, a friend of one of her patients and the short time that they spend together leaves both of them wanting to see more of each other despite the fact that Zane, as a soldier, is required to report for duty to fight against the Japanese. They are able to keep in touch somewhat through unreliable mail and those letters mean so much to each other. When the enemy shoots Zane’s plane, what will happen? Injury, death, destruction…and a chance for a reunion? This book was wonderful! It held so many facts that had you feel that you were in the 1940’s. I loved the part where Zane realized that his best friend’s wife was of Japanese descent. He had been so hateful (and who could really blame him after what he had seen and endured!) towards the Japanese, but he realized that Americans are simply Americans. No need to separate due to race or background. The goodness of a person’s heart is what matters! I received an ARC of this book from the author but that in no way effected my opinion of the book. The third book of a series set during World War 2, this story brings out a mixture of emotions. There is sadness, joy, fear and love plus the feelings of hatred towards fellow human beings just because of their nationality. Billie is a phenomenal character who has just the right mixture of pathos and firmness to make her a good nurse to men who have suffered terrible injuries through war. It was good to catch up with Rock and Miko from Garden of her Heart and the continuing plight of Japanese Ame The third book of a series set during World War 2, this story brings out a mixture of emotions. There is sadness, joy, fear and love plus the feelings of hatred towards fellow human beings just because of their nationality. It was good to catch up with Rock and Miko from Garden of her Heart and the continuing plight of Japanese Americans, who were rounded up and interned. This truly was a horrific time in world history. I love the character of the (not really ) awful landlady Miss Burwell, a humorous character whose personality shows hidden depths. WWII as a backdrop. This book brings romance, love , and compassion to you. This Author writes incredible romances and this one does not disappoint! You will not regret reading it. Historical information abounds. Intertwined into a beautiful story that leaves you wanting more. I love how you can absorb into the Authors story and feel a part of it. The strong characters and detail to history make you feel like you were right there in the 1940's. I received an Arc of this book and have voluntarily WWII as a backdrop. This book brings romance, love , and compassion to you. This Author writes incredible romances and this one does not disappoint! You will not regret reading it. Historical information abounds. Intertwined into a beautiful story that leaves you wanting more. I love how you can absorb into the Authors story and feel a part of it. The strong characters and detail to history make you feel like you were right there in the 1940's. I recommend this series of books, they are stepping back to the 1940s during WWII. These stories have what Hatfield's books are known to be, sweet, clean, romance and humor, with no cliffhangers, (just some new characters that I hope get their own stories in future books). Story telling at it's best, a relaxing romantic read with respect and honor to those who served their country. Thank you Shanna Hatfield for bringing this time period to life with such endearing characters. Another amazing book by Shanna! I’m really loving this World War II Series!! Nurse Billie gets her own story in this tale! We get to reunite with Rock and Miko from book 1, and finally meet Zane, another War Hero and Rock’s best friend! This is an exciting and emotional book with an attempted murder... the relocation of Japanese-Americans... and a Birthday surprise or two! At a time in U.S. history that is historically full of sad stories, this is a sweet glimpse into the softer side of the war. Read full review in the 2019 February issue of InD'tale Magazine. Another outstanding story in this series by Ms. Hatfield! From the WWII era details (including songs, movies, news, products--I remember potato chips in a can!! ), to the interaction of characters from previous books in the series, to the WWI drama and romance, I was taken away! I highly recommend this book! Can't wait to make some Canteen Cookie Bars! I really enjoy Shanna Hatfield’s novels, and Dream of Her Heart is my favorite so far. It’s a wonderful wartime romance. I appreciated Ms. Hatfield’s thorough research, and she makes this time period come to life! I enjoyed learning more about World War II, while reading a heartwarming book. Highly recommend! I thoroughly enjoyed this romance which read as a stand-alone, but included some characters I met in an earlier novel in the series. Great characters with plenty of suspense regarding what direction the plot would go. Definitely recommend this book. Great story of love that endures even during war. The WW2 settIng have the book a richness & deepened the story. The growth of the relationship between Billie and Zane was sweet and real. A great read. A charming World War II romance full of history, heart, and a happily ever after is the perfect description of this story. A patient, his best friend and a kind caring nurse make this an interesting causalities of war story. I was gifted a copy, my review is voluntary. This is a great World War II love story. The characters were great, including some reminders of a previous story. This is a sweet, clean romance.